This is a reference book which guides the student on a selective timeline tour through ancient history, outlining the major events and personalities, and noting the primary literary sources from which these things are known. PLEASE NOTE: The DVD is no longer included. So you've always wanted to study history by reading primary source documents, but you've got some problems: You don't know where to start. You're afraid some of the material may not be suitable for your children, but you don't have the time to pre-read it all yourself. You're allergic to the dust and mold you are convinced comes along with reading such ancient documents. Or maybe you just don't know where to look for such documents, or you can't afford to buy and store them. This combination book and set of three CD-ROMs solves these problems. It's hard to know where to begin when studying history, but the authors of Ancient History from Primary Sources, Harvey and Laurie Bluedorn, begin with the very best and most accurate source for history: the Bible. They explain why any other sources might contain inaccuracies, and they discuss how to evaluate what you read. They also categorize the many ancient authors as either historian, geographers, and biographers; orators; rhetoricians, logicians, and grammarians; scientists, physicians, mathematicians, architects, military, and agriculture; authors of fables; philosophers; Christian apologists; poets and satirists; tragedians and comedians. They also give hints as to which authors are right for various ages and which ones you might want to pre-read before even allowing your twelfth grader to read them. A big chunk of the 222-page, large-format book is an extensive timeline chart. This lists the major events of each time period, and along with that, lists books from the Bible and which of the many primary source documents fit into that time period in chronological order. Then comes the main part of the book, an index of all of the primary authors. They start with the Bible, and then list the following for each author: a brief description of the author, a list of all extant works by that author, and then significant excerpts. There are also several appendices: a discussion on the study of ancient literature, an analysis of whether the Apostle Paul was a classical Greek scholar, information on Bible chronology difficulties, a list of sources and a list of history curricula and resources which can be used with this book. The accompanying CD-ROM set contains the complete works of over 25 authors from Ancient Babylon, Sumeria and Egypt (approximately 100 separate works) and over 90 author from Ancient Greece and Rome (too many works to count). Good deal! If you are a non classically educated parent providing a Christian classical education for your children this is an invaluable resource. It would be wonderful to have copywork from the ancients or recountings of historical events told by those who lived closer to the time period than we do. To do this would require the daunting task of sifting through hundreds of online resources to find ancient historical writings. The problem is not just locating them but then determining what would be appropriate for your children since there is quite a bit of shocking and inappropriate information. If you are educating several children as well as attending to your household it is understandable that you wouldn’t even try to seek out such material. With Ancient History from Primary Sources: A Literary Timeline the work is all done in a very approachable, logical format. In this volume you will find the names of primary source authors listed in chronological order, with a short bio as well as which of their works are extant. The accompanying CDs have the writings that are cited. An actual timeline is in the book paralleling the different cultures with the list of writings placed in their appropriate time period (Hebrew& Christian, Egyptian, Mesopotamia, Greek, Roman). This volume also includes important resources for parents i.e. Using Primary Sources to Study History, Four Approaches to The Study of Ancient Literature, Bible Chronology Puzzle and several other interesting appendices. Once again, I enthusiastically thank the Bluedorn family for sharing the insights the Lord has given them over the years, therefore enabling our present journey in home education to be a smoother one. Your first reaction to Harvey and Laurie Bluedorn's work Ancient History from Primary Sources: A Literary Timeline will likely be, "Wow!" Mine was. The 223-page softcover includes 51 small and five full-page illustrations plus five full-page, antique maps. The cover art is from an oil painting carefully researched and created by their talented daughter, Johannah. The book is neither a history curriculum nor a textbook, but will enthusiastically complement curriculum or act as a resource. The three CDs included with the purchase price provide full-text, English translations of most of the classical literature to which the book refers: more than 1,200 individual works from 80 different authors, from A-to-Z - that is, from Aeschines to Xenophon. Thoughtfully, the writing team begins the book with a chapter on "How to Use This Book," and a subsequent, very helpful chapter on "Using Primary Sources to Study History." I appreciated the paragraph contained in the latter of these two, captioned "The Biased Nature of the Historical Record." The Bluedorns accurately tell us, "We must sharply distinguish historical fact, "what indeed actually happened," from historical record, "what someone believes happened from his own narrow perspective." From there, the team points their reader to the Bible and Biblical principles for studying history. Why bother with primary sources? Why not just take a textbook's word for history, and move on? You could, but then you would miss so much and you may be subject to a one-sided view of the event under study. However, delving into ancient texts may seem daunting for parents who are seeing these texts for the first time themselves. Which are safe for students? Which are questionable or graphic? Thankfully, the Bluedorns address all of these questions, pointing out which are suitable and at what age, and which may make you "take a thorough shower after you're finished." The Bluedorns' extensive research is amazing. The timeline itself will likely become indispensable. You'll learn about the Bible as a history book, the original order of the book and letters within the Scriptures, background on the Apocryphal books and the Dead Sea Scrolls, Literature of Egypt, Mesopotamia, and, the most extensive group of sources, the Literature of Greece and Rome, including early Christian writings. I strongly suggest that you read the "How To" chapters in the beginning of the book and then the Appendices before jumping into the amazing world this work opens. The authors are correct: The next best thing to observing the events of antiquity is to "experience these events through those who were actually there - seeing what they saw, and hearing what they heard. We can read the original accounts as they have been preserved for us. This book is a guide to doing just that." The book's offerings are rated for adults and children, ages 12 and up. 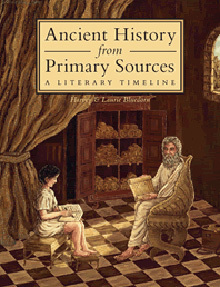 Compiled by experienced homeschoolers Harvey and Laurie Bluedorn, Ancient History from Primary Sources: A Literary Timeline is an extensive bibliography of primary sources of ancient history, ranging from the writings of Aristotle and the scriptures of the Bible, to the chronicles of Pliny and Virgil, and much, much more. Offering history curricula, two CDS with full text English translations of most of the literature referred to in the book, as well as biographical information on the authors of the ancient writings, Ancient History From Primary Sources: A Literary Timeline is a first rate, "user friendly" resource written and designed especially for homeschooling parents and of invaluable assistance to traditional classroom teachers of children ages twelve and older. Ancient History from Primary Sources: A Literary Timeline, (Trivium Pursuit, 2003) is a refreshing treat for the family in love with studying history. Especially helpful to Christian homeschoolers, this priceless reference book guides the student on a selective timeline tour through ancient history . . . I now have a copy of this new curriculum [Ancient History from Primary Sources] by the Bluedorns, and it is going to be a very valuable addition to the resources of classical educators. The level of use I would put it at is the dialectic and rhetoric stages. Here is an excerpt from the introduction on the use of this curriculum: "This book is not a history curriculum, nor a textbook, nor an all inclusive timeline. Others have written such things [included in an appendix], and this book supplements them. This is a reference book which guides the student on a selective timeline tour through ancient history, outlining the major events and personalities, and noting the primary literary sources from which these things are known. Time-wise, this book covers the period from the creation of the world to the fall of Rome in ad 476. Space-wise, this book covers the civilizations of the near east and west. Each event or person in history is accompanied by suggested readings from various ancient sources." The first quarter of the book is a detailed ancient history timeline. If anyone is familiar with the Timetables of History reference, it is sort of similar to that, in that a column exists for Hebrew and Christian history, Egyptian, Mesopotamian, Greek, and Roman history. It is superior to that resource in that, first of all, all the evolutionary nonsense doesn't have to be waded through, and second of all, instead of listing every last event, the major events and persons are given maximum exposure. Still it is a very detailed treatment, but not so detailed as to be overwhelming. Under each event or person in the timeline, then, is a listing of the ancient literature which told the story of that event or person. The next section of the book is an alphabetical guidebook, if you will, to ancient literature. It is divided by region. The Bible, the primary source for the Hebrew and Christian column in the timeline, has a large section to itself; the authors of the books are discussed, and what each book covers, and how it fits into the ancient history big picture. The next regional section is Egypt, and all the literature we have from ancient Egypt is then given a brief summary. And so on for Mesopotamian, Greek, and Roman. As an example, the Bluedorns write to introduce the Egypt section: "Here is a select list of literature from Egypt. We have chosen those works commonly considered to be culturally important, yet not inappropriate for students age twelve and up." As ancient literature is known for inappropriate material, this is a wonderful service for classical educators. Something which is very helpful is that when describing long works, they list significant excerpts, so that a whole work doesn't have to slogged through to get to the most relevant bits. The approximately last quarter of the book are appendices, in the usual thorough and helpful manner of Bluedorn appendices. The appendices include: Four approaches to the study of ancient literature; Nothing is Neutral; Was Paul a classical Greek scholar? ; The Bible chronology puzzle (WONDERFUL! ); Sources consulted (for their ancient literature research; extensive as usual); and finally, History curricula and Resources (to be used with the book). All in all, a very much needed analysis of primary sources. I forgot to mention that it comes with a CD of the texts of the primary sources covered in the guide, so you don't even have to go out and buy Penguin classics if you don't want to. This is going in CCH's catalog for both dialectic and rhetoric ancient history and literature. Harvey and Laurie Bluedorn, veterans in the world of Christian Trivium homeschooling, wrote Ancient History from Primary Sources: A Literary Timeline as a history supplement to help anyone to study history from the real sources of history -- the ancient writings themselves.As in all of their materials, the Bluedorns emphasize the Christian perspective of how to read ancient literature and caution parents to determine the appropriateness of specific writing based upon family beliefs. After an introduction citing how to use the book/CD, using primary and principal sources for history study is discussed. In order to get the most accurate view of events of the past, one must get as close as possible to an eyewitness account, or primary source. Frequently, primary sources are not available, so secondary sources, documents written by people who spoke to others who witnessed the events, may be used. If the secondary source is the only record of the event that has survived, it is called the principal source. The Bluedorns offer logical questions for the student to ask about the accuracy and biases of sources. The next section of the book has a timeline from creation (c. 3958 B.C.) to the fall of Rome (476 A.D.) Broken into columns for Hebrew and Christian, Egyptian, Mesopotamian, Greek, and Roman civilizations, the timeline includes major events and suggestions for ancient writings that apply to each time period. The Author and Primary Source Index follows. Using the same civilization categories as the timeline, this section describes the primary literature for each civilization with the Holy Bible getting a section of its own. A brief biography of each author is given along with a list of works included on the CD-ROM. The final section of the book consists of six appendices. Four of them have the Bluedornsarguments on particular subjects: how to approach the study of ancient literature through secular, religious, or distinctly Christian methods; the inability to have neutralityin the world; Pauls background as a scholar; and chronology of events in the Bible. The other two appendices list a bibliography and a list of curricula with which this supplement might be used. Included in the Ancient History from Primary Sources: A Literary Timeline package is a two CD set published by Brainfly.net. The over 1,200 works from eighty authors are viewed using either a web browser or Adobe Acrobat Reader. Recommendation: Ancient History from Primary Sources: A Literary Timeline is a useful supplement for dialectic and rhetoric aged students and for the motivated parent. It offers the balance of Christian commentary with ancient Pagan writings that will make the most concerned Christian parent comfortable. The timeline section makes it particularly easy to select a work that is applicable to current studies. The CD-ROM worked well on my computer, a pleasant surprise for a Macintosh and Safari browser user. The fonts are easy to read, and the menus are simple though switching between disks is necessary. Many are available on the Internet, but those without high speed access will find it very handy to have this many works at their fingertips. All in all, Ancient History from Primary Sources: A Literary Timeline is a great addition to the classical homeschooling market where little time has been devoted to helping Christian parents use ancient literature. This resource is still warm from the press -- a frivolous claim since the contents are thousands of years old. Ever wonder what was rejected as divinely inspired by Protestant church fathers? Could you explain the derivation of Pi as well as Archimedes? Just what did those ancient writings contain anyway? Even if you wanted to read them, and you should read some of them, where would you go to find what you wanted? You don't need to wonder any longer. Your journey to find the writings has been considerably shortened. The Bluedorns have put together a study guide with accompanying CDs of ancient literature that, were you to buy, the actual cost would choke you, not to mention the tonnage that would bury even the most dedicated bibliophile. What was inaccessible or, at the least, difficult to acquire cohesively (and forget chronologically) is now at your fingertips. "Here in one place, you will find listed in chronological order all of the major primary literary resources for the events of ancient history." Never have there been truer, more aptly written words. As is the Bluedorn custom, included are precise guidelines for determining what is an ancient primary source, why one should read the ancients, and how to do so with the filter of the Bible in place. A primary source is information from a person who was an eyewitness or participant, knew someone who was there, or lived around the time in question. Primary sources could be written, or even carved in stone, on a monument. The best that we have is, obviously, the Bible. The next best are those preserved through the ages that have been corroborated with other primary sources. The best comparison I know, though not ancient, is if you have read the written prayers and war diaries of George Washington. Once you have read his spiritual record, you truly know him and something of the era. Therefore, a complete history study will necessarily include primary sources in addition to the typical text or biography. Do not mistake the guide for a curriculum. This is to be used alongside a text. In the back of the book is a list of history courses that this guide would work well with. It includes, but is not limited to, Greenleaf Ancient Men of Greece and Rome, KONOS-Ancient World, the Principle Approach: Universal History Vol. 1, Truth Quest History, Streams of Civilization, and Tapestry of Grace. The Hebraic writings cited are not included on the CDs but are accessed by websites listed in the guide (Laurie tells me that an additional CD would be necessary). Listed as only one of the extras and on the CDs are full texts of Guides to the Egyptian and Babylonian Rooms of the British Museum by E. A. Wallis Budge (c.1910). You can page through this interesting discourse and discover an obelisk of King of Assyria B.C. 859-824 on which the scene illustrates the text 'and among the vanquished princes is "Jehu, son of Omri." ' Also you can see casts of doorposts of Darius and Artaxerxes with descriptions of prisoners who had ropes around their necks. You can see the letterings of Nebuchadnezzar's time with the English underneath it. You can see the Coptic letterings that appear as golf tees (no indication of par). You can see the Egyptian hieroglyphic alphabet and read the names of the Pharaohs. Herein are the extraneous records, the proof outside the Bible that supports the truths we know and trust. Read the story of an explorer who upon seeing a 3' X 2' X14" stone in the tent of a friendly sheikh immediately tried to purchase it for Germany. But "as soon as the natives learned that the infidels were in search of the monument, they began to interest all persons to get a hold of it." You will have to read for yourself to find out how the Moabite Stone became amulets and charms. Compare the code of King Hammurabi that is, not surprisingly, similar to the Ten Commandments and other Hebraic law. View a map of Sennacherib's palace that was in Nineveh. He, or most likely his scribe, does not parse words when describing the decimation of Jerusalem and how he received tribute from Israel. And. . . well, there is so much history here. The guide and CDs together would serve any student well, but there is more. You must not miss the appendices which are really logic lessons from the Bluedorns There are four: Four Approaches to the Study of Ancient Literature; Nothing is Neutral (worthy of the pulpit); Was Paul a Classical Greek Scholar? ( a hint: consider the proportion of references to Greek culture to the balance of his work); and The Bible Chronology Puzzle. I shouldn't tell them, but it is unavoidable. The Bluedorns should probably charge $5 extra just for the bibliography. The entire product is unmatched in its scholarship, organization and sheer volume of information. It is another jewel in the crown of the Trivium people. As homeschoolers, we have opportunities to put before our children resources that add color and dimension, scent and sound to the panorama of history. Wow. This is an excellent text, and if read and studied in a thorough manner (including reading the original texts included on the CD) would give a student an extensive education in ancient history. Over 1200 individual works on the CD! Timelines that make sense! Interesting writing style. Highly recommended. There is perhaps no better way to make history come alive than to read the actual words of important historical figures. Study of the primary sources is a gratifying and mind-expanding approach to learning history. Once upon a time, there was virtue and value in being "a well read person" who understood classical literary references such as "crossing the Rubicon" and "the rosy-fingered dawn." In our era of Gameboys and dumbed-down public schools, not many college graduates have read Plato and Aristotle, or Cicero and Augustine. But classical education is making a comeback, in not a little part due to the labors of Harvey and Laurie Bluedorn, the authors of "Ancient History from Primary Sources." This wonderful resource begins with a timeline from Creation through the Fall of Rome (A.D. 476). This unique timeline is divided into five columns to indicate Hebrew & Christian, Egyptian, Mesopotamian, Greek and Roman histories. Each column indicates the years of historical events and major literary works, so that one could see at a glance the contributions of each culture to western civilization. After the timeline, an "Author and Primary Source Index" is provided which gives an outline of the content of each primary source, such as historical events recorded by Herodotus and Tacitus, philosophical works by Plato and Aristotle, and mathematical treatises by Euclid and Archimedes. The "Author and Primary Source Index" includes chapters on The Bible, Literature of Egypt, Literature of the Hebrew People, Literature of Mesopotamia, and Literature of Greece and Rome. Appendices are provided for helping a contemporary reader begin a study of history from the sources, and for bringing a Biblical approach to studying pagan sources. In addition to young scholars of history and the classics, this book would also be helpful to parents seeking to belatedly acquire a "well-educated mind." The value of this magnum opus is further enhanced by the inclusion of a two-CD set, "Primary Literary Sources for Ancient History," which includes the complete text of over 1200 ancient works by 80 classical authors. The sources on this disc include every important author from Arrian to Plutarch to Strabo. This CD set alone is worth much more than the asking price. The Bluedorn's sourcebook is an indispensible resource for every serious student of history and every student of the classics. And the value is inestimable for Christian Classical students of the "Trivium" approach, homeschooled or otherwise. Excellent! This orderly compilation of rich historical sources is a breath of fresh air. It is for those preparing for or in process of teaching/studying ancient history. This refreshing book with accompanying cds are purposed to “make it much easier for anyone to study history from real sources of history.” Simply stated...it does just that. This book covers Creation through A.D. 476 and includes a rich supply of well organized literature and a brief explanation of the historical figures. What I appreciate most is the clear explanations of the contents to speed my searches in both the book and the cds. It is thrilling to discover on the cds the literary works written in their original language as well as in English. The Bluedorns clearly state that they did not intend for this work to be a curriculum in itself but an aid in diving deeper into the study of ancient history. Well done, I say...Again, they have handed the Classical Christian Homeschooling community a gem that will save us hundreds of hours of research, as we try to give our children the most thorough education possible.